Above & Below: Bottle pictures of the newest 8 Color Club Exclusive Japanese Glitters. Above are what I color the 'colored' ones, and below, the 'similar colored' ones! Top L-R: Bishop's Weed, Blue Hawaii, Dazzling Orange, Fresh Mint. Below L-R: Calendula for Joy, I Love You, Twinkle Peach, Sparkling Cassis. Below: I Love You, shown in 2 coats. This is much more pigmented than Twinkle Peach, shown below. This is technically called Rose, I Love You, but the label reads I Love You. 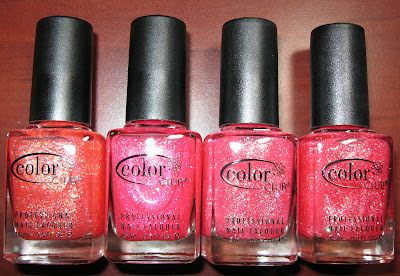 It applies true to the bottle color, which is a bright rose pink with tiny multi-colored glitter. Below: I Love You with a matte top coat. Below: Twinkle Peach, shown using 3 coats. Clearly, 5-6 coats would be needed to bring the color up to the bottle shade. This is a very pale shade of peach with the same multi-colored glitter. However, the glitter is not as bold in color, due to a lower contrast against the lighter base shade. Below: One coat of Kleancolor's Neon Sapphire over Twinkle Peach. 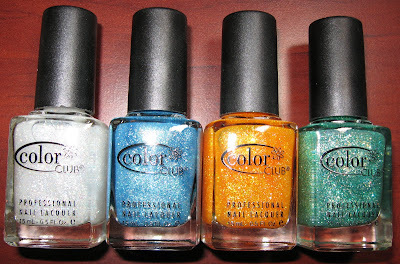 I like to use these glitters as bottom coats or top coats with other polish shades. Today I received the newest 8 Color Club Exclusive Japanese Glitters that Victoria Nail Supply recently added to their stock. I swatched 2 of the shades so far, and will be working on the other 6 today and tomorrow. I used three coats on Twinkle Peach, and as you can see, it needs several more than that! I Love You applied better, as I used 2 coats. I see in the photos that perhaps 3 would have looked nicer. I Love You is much more pigmented than Twinkle Peach. For those of you who have some of the glitters from Color Club, you know that the formula is somewhat jelly-like. It takes a little trial and error to apply them evenly and at the right thickness. What I like the most about these glitters is that they work well as a base color with another coat of polish over them as shown above with the blue Kleancolor (Neon Sapphire), and they work even better as a top coat over a darker polish shade. I prefer using them in this fashion, rather than by themselves. I'll do a few swatches using them under and over other polishes, coming up. I LOVE the Neon Sapphire look. I Love You is my favourite! Can´t wait to see the others. I Love You is really pretty. I can't wait to get it. Phyrra~I do too! I want to play around with these as base colors some more. Ange-Marie~it's really pretty, although I wasn't quite sure what it would look like! AllYouDesire~I like that one too. It had great coverage. gildedangel~they really are pretty all lined up! And on the nails, too! Nathalie~it's so bright and pretty, without being 'too much'. Lucy~I think you'll be pleased with these. They're very versatile.